A young New Zealand woman died from meningitis in late June. She should not have died. She had gone to the Wellington Hospital emergency department with severe flu-like symptoms but had been forced to wait three hours to receive attention. The case shocked New Zealanders. How could this happen? Sadly, many New Zealanders have an answer to this question. They share a common belief that the nation's health system is in crisis. Given the demonstrable weaknesses in New Zealand's State-funded health care, the advances that have been made in Taiwan in recent years take on added significance. Once, New Zealanders were proud of their health system, while other countries envied it. Now New Zealanders read about Taiwan's impressive statistics and ponder about being left behind in international standards. However, it is not that simple. Let us note a few precautions. Firstly, New Zealand's health system is not in crisis. It continues to deliver excellent health care and services at all levels, most of the time. It does have problems but they should be kept in perspective. They relate to excessive waiting times and such difficulties as some cancer sufferers being sent to Australia for treatment. The quality of medical care is not in question. The quality of administration is. Secondly, comparisons between the New Zealand and Taiwanese health systems can be misleading. New Zealand is a three-times larger land mass, of difficult mountainous terrain, with a population of only 4 million. Its largest city, Auckland, has little more than 1million people. Its economic growth rate has been lower than Taiwan's through the last decade, yet its people, who are among the world's best educated and most traveled, have high expectations. Thirdly, New Zealand is a low-waged economy, relative to others in the developed world. Because of this, it has difficulty attracting and retaining highly skilled medical staff. Fourthly, New Zealand's history in the 20th-Century is of a strong egalitarian ethic, prompting increasing Government interventionism in social affairs. Only in the last 20 years did a reaction to the wastefulness and lack of international competitiveness which this spawned bring a change to a hands-off approach by the Government. The Great Depression of the 1930s was a watershed for public policy in New Zealand. The Labour Government that came to power in 1935 built on early century moves to provide social security for all people, "from the cradle to the grave". This involved a comprehensive health system, funded by the State, from a special tax on all income earners. The system performed well and became the pride of New Zealanders. However, its administration became a clumsy and wasteful bureaucracy. Its costs became unsustainable. The problems in the system now are the results of several rounds of re-structuring imposed by successive Governments since the mid-1980s. One by-product of the changes has been the growth in the private health sector. Problems such as those met by the young Wellington meningitis victim have driven large numbers of people to purchase health insurance from private providers. Just as that woman had to wait three hours in a State-funded hospital, the fear of waiting is probably the overriding image of New Zealand's public health system today. People needing hip replacements or cataract operations have to go on waiting lists and may not receive attention for three or four years _ if at all. No wonder many take the expensive option of health insurance, which guarantees immediate attention in a private hospital. Health insurance costs vary according to age and to the level of benefits the purchaser chooses. As an example, a 55 year-old choosing a regular programme, which provides 80% payment of most medical and surgical treatments and pharmaceutical prescriptions, pays an annual premium of about $400 ($US240). The premiums increase markedly from age 65. Many people cannot afford them, so they are left to rely on the public health system. The impact is greatest on the elderly. This raises issues of New Zealand demographics. Statistics show the population is ageing and will age at an accelerating rate. The median age of the total population is 34, but will rise to 46 by the year 2051. The proportion of population over 65 years will double (from 12% to 25%) by 2051. Numbers over 85 years will increase by 600%.State spending on health increases steadily for people from age 50, and rises dramatically for those aged 75-plus. New Zealanders aged 85-plus consume nearly $12,000 ($US7,200) a year each, on average, of State health funding. State health care for this age group costs New Zealand $11million ($US6.6m) a week. This figure is set to rise sharply. With a proportionately smaller work force and economic growth at about 3%, largely reliant on the vagaries of international markets for primary produce, many people wonder where the money will come from. One response is the promotion of preventative health programmes and moves to keep sick and elderly people in their own homes, rather than in hospitals. 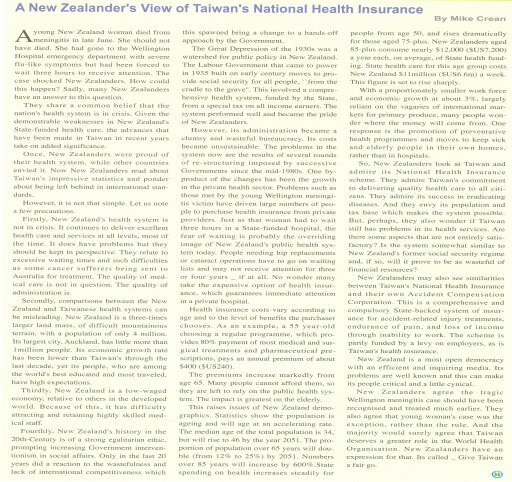 So, New Zealanders look at Taiwan and admire its National Health Insurance scheme. They admire Taiwan's commitment to delivering quality health care to all citizens. They admire its success in eradicating diseases. And they envy its population and tax base which makes the system possible. But, perhaps, they also wonder if Taiwan still has problems in its health services. Are there some aspects that are not entirely satisfactory? Is the system somewhat similar to New Zealand's former social security regime and, if so, will it prove to be as wasteful of financial resources? New Zealanders may also see similarities between Taiwan's National Health Insurance and their own Accident Compensation Corporation. This is a comprehensive and compulsory State-backed system of insurance for accident-related injury treatments, endurance of pain, and loss of income through inability to work. The scheme is partly funded by a levy on employers, as is Taiwan's health insurance. New Zealand is a most open democracy with an efficient and inquiring media. Its problems are well known and this can make its people critical and a little cynical. New Zealanders agree the tragic Wellington meningitis case should have been recognised and treated much earlier. They also agree that young woman's case was the exception, rather than the rule. And the majority would surely agree that Taiwan deserves a greater role in the World Health Organisation. New Zealanders have an expression for that. Its called _ Give Taiwan a fair go.